It’s always very busy at Liverpool Homeless Football Club HQ, but September seemed to be here and gone in the blink of an eye. Always at the top of our agenda is the need to create positive interventions. Provide life changing opportunities and improve mental health and well-being. We were busy attending mental health seminars and workshops as well as organising events and tournaments. There were meetings with partners and supporters to discuss our ideas and future plans. All in all we had a very productive month. We always try to tackle the issues that matter to our participants, both on and off the pitch and will continue to do so. We are constantly raising awareness and encouraging people to share their stories. Remember you are never alone at LHFC. Just reach out, speak up and ease the burden. If we can’t offer you the support you need we will always find someone else who can. Together we can overcome the challenges that face us #morethanjustfootball . My time at LHFC has allowed me to get involved in a variety of programs. All of which have included positive interventions to improve mental health. It was instantly apparent to me that improving mental health by breaking down barriers and building bridges has always been one of the main aims of LHFC and will always remain a priority. Our main purpose is to use the power of sport to change lives, improving mental health and wellbeing. We have had lots of visitors to the office over the past month, some seeking support and advice about the roll out of Universal Credit. If you are one of those affected then please click here, read the blog and follow the links which will signpost you to those who can help. We have had a couple of visitors who have just popped in for a cuppa enroute to their new jobs. One told us “My life is now worth living”. For me personally it’s those days that make it all worthwhile. It’s a privilege to see the joy and confidence on LHFC friends faces. When people are empowered to turn their life around, gain employment find suitable accommodation and regain self-worth and independence, its then that you know you have played a small part in offering crucial support that makes a real difference. LHFC took the pledge to join Zero Suicide Alliance (ZSA) and all LHFC staff and some members have taken the free suicide prevention online training. We have shared our experiences with as many other organisations and individuals as we can. 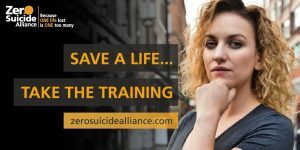 We will continue to signpost every person who comes through our doors to the ZSA website to join the national campaign to end suicide and urge everyone to take the FREE training. The more people to participate in the Zero Suicide campaign the more lives will be saved. 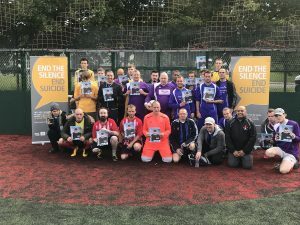 September matchday was the perfect opportunity to raise awareness of suicide and a huge thank you must go to Colin Dolan. His opening speech which was both very moving and thought provoking. Colin spoke about the suicide prevention training resulting in many players and support staff pledging their support for the ZSA campaign. Thank you to all teams who took part, your continued commitment and support is very much appreciated. We have had some positive feedback from participants. There are lots of ideas and suggestions for our October 30th presentation day and planning is well underway.